Once again, Todd McLellan is making it clear that he isn’t remotely inclined to take his time with training camp decisions. Just one day after the Oilers knocked seven names off their roster, McLellan axed an additional eight players from consideration. #Oilers assign Ben Betker, Greg Chase, Braden Christoffer, Josh Currie, Ryan Hamilton, Kyle Platzer & Patrick Russell to @Condors. The #Oilers have also released Ryan Vesce from his PTO. Betker’s departure isn’t even a little bit surprising. The sole defenceman cut today spent most of last season in the ECHL and wasn’t in competition for NHL employment. If there’s any surprise on the blue line, it’s merely that Joey LaLeggia didn’t get shipped out with him. Tyler Benson’s young and hurt and will be back in junior at some point, while Josh Currie, Kyle Platzer, Ryan Hamilton, Braden Christoffer, Mitch Moroz, Patrick Russell and Greg Chase have to be seen as being AHL-bound. Of the eight names on my list of expendable forwards, six were cut today. Benson survives, but that likely has to do more with his injury situation than anything else. The real exception is Mitch Moroz, who has earned positive reviews for his performance early in training camp. Moroz did make positive steps in the AHL last year and while he’s still not much of a scorer he does bring some unique qualities to the Oilers organization. Likely this is only a temporary reprieve, but it does seem to suggest that the coaches see something there. On the other side of things, the early departure for Vesce is a bit of a surprise. Lowetide had a nice piece on the player on this site yesterday, and he had history with McLellan. Vesce was in an odd position because of his age (34) but showed last year in the KHL that he’s still a competent scorer in a tough league. I wonder to what degree this decision was simply a matter of not stringing the player along when there isn’t going to be a place for him on the 50-man list. With a handful of exceptions, the players left in camp are ones that we can imagine finding their way into the NHL at some point this year. Yesterday we were a dozen cuts away from the interesting names; now we’re basically there. Atta boy McClellan, let’s get down to business and get off to a good start! That’s to bad about Ryan Vesce. If you know he won’t make it, get it done and cut him loose. I like Todd getting to the players he wants and getting them ready. I’m pleased to see Mitch Moroz fighting for a spot. A lot of bloggers have gone on and on about how he was a bad pick. Maybe he was picked too high, but the reality is, outside top first rounders, the most that the bulk of draft forward picks can aspire too is the third line, more likely the fourth. Moroz is built for that type of energy / agitator role. BREAKING: Connor McDavid survives another round of cuts. FOR NOW. So refreshing to see this approach. I would have fought hard and lost the battle to not stick a fork in my eye if I had to witness another Eakins-like approach to pre-season. I don’t get why they kept Moroz. Positive camp or not, who’s he seriously beating out? He’s a 4th liner who played the left side. With McDavid most likely to be named captain, not a chance in hell Hendricks is getting cut. That’s seriously who Moroz maybe one day has that spot. On defense, I don’t see the point in Laleggia being here. Same goes for Simpson or Musil. They all shoot left. They are behind Nurse, Reinhart and Oesterle. What are they here for? Even Mark Fraser, another left handed guy. Excluding Ference who’s hurt if you slot in Gryba, they still have 14 Dmen for 7 spots. 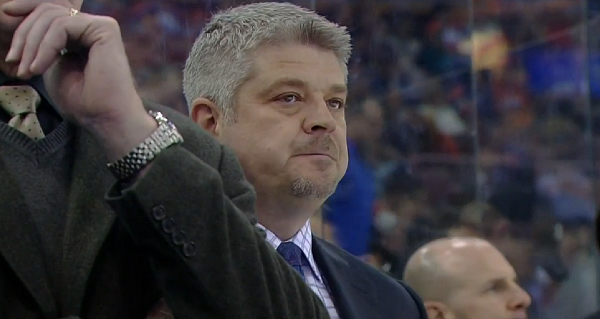 Klefbom, Larsson, Davidson and Sekera are givens. So there is 3 spots available and they have 10 guys for them? Seems excessive. Don’t overthink things. The reason they didn’t cut these guys is because they want to see them a bit more. Maybe for another few practices and a game or two. It doesn’t mean they’re auditioning them for an opening night spot on the NHL roster. They just want to know more so that they can make (hopefully!) better decisions in the future (e.g. injury callups, trades, contract renewals, etc.). Klefbom, Sekera, Davidson, Nurse, Reinhart, Oesterle are all ahead of those guys on the left side. So realistically, Simpson, Musil, Laleggia and Fraser are 7, 8, 9, 10 on the detph chart. If you are having to dip into those guys this season, you are screwed. yup, it’s never a bad thing to see a little bit more from Moroz and LaLeggia before they get sent down, especially if this is the final year of their contract. and a whole lot of other players are all RFA’s after this season like Simpson, Musil, Oesterle, Pitlick, Laurikainen and Khaira, and have a lot to prove this year if they want to be re-signed. this could be it for more than a few of them ! Until preseason is over they still need some players to slot in the lineup so they don’t run their regulars too hard. None of the full time nhl’ers play a full preseason. It’s not necessary and they want to preserve those guys for the regular season games. First, they will Keep Moroz around to battle for Hendo’s spot next season ( think about it MAN). 2nd you keep extra D around for the scrimmages in Practises during the preseason. If you have Extra Forwards you need EXTRA defence to balance Practice. COME ON MAN. Have you never attended a hockey team tryout before. Next time if you Don’t Know Hockey Shut up and Don’t Post. You made your self look REALLY STUPID. The poster wrote that he didn’t understand something, so by posting he might better understand going forward. that’s what comment sections are for. Your comments regarding balancing a tryout roster have merit, but the nastiness was not required. You, sir, are out of line. Pretty harsh man!! Hockey’s not a religion to everyone and aren’t informed about every detail. He didn’t seem to be trolling or nasty so I’m not sure why you feel you need to come at someone like that…I think its you who actually looks stupid!! Hockey is the Blood of Life. the Savior McSexy and lead the true 1st tier fans to the promised land of the playoffs. And us tier 2 fans will follow behind with our brooms sweeping up the poop. Yes, yes you will, just remember the single ply goes to the upper concourse, the 4 ply to the Sportsnet Club seats and PCL Loge level. Because janitor might be your only way in HAHAHAHAHA. It’s called trade bait. Showcase their progression for possibly a later trade. Remember when Eakins waited till the middle of October to finalize his roster.. oh what competent management looks like. Mcllean cut 15 players in a span of 24 hours. Yeah, don’t waste time on them and give them a chance to find a home somewhere else. Scout the talent quickly, TC isn’t for development, it’s for evaluation. Bakersfield is for development. I know Betker had 0 chance of making the team, but I was pleasantly surprised by his progress. He looked fairly steady out there. If he continues to progress and has a good season, we might have an interesting prospect in him. That might just be me though. Canucks drop 16 more players and are down to 44 bodies with 5 of those yet to return from the Worlds as yet . Looking at their roster tonight , you have to wonder how bad Vancouver might be this year . Awesome! You have to impress at camp early on if you want to stay. Mac-TEakins seemed to let players work through training camp/pre season slumps which was ridiculous. After watching the game last night I think Reinhart and Musil should have a race, with the loser leaving town. Do the Oilers scouts even look at skating when evaluating defense or do they just look at size and famous last names. Reinhart got his doors blown off twice in a shift, once by offensive dynamo Derrick Dorsett. He looks like a 45 year old beer leaguer playing shiny with a bunch of 20 year old junior players, just zero mobility out there.